"Best Overall, Best Value. Best Flavor, too." Shiitake Kits can be refrigerated for a short time, but are designed to be started when received! Each kit may produce 9 - 18 oz of shiitake mushrooms in 2 to 4 flushes. Organic Mushroom Spawn used to seed these logs is Certified Organic by Quality Assurance International (QAI). Request Mushroom Kit Gift Certificates in the Special Instructions section of your Shopping Cart. 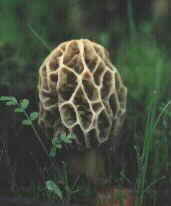 This mushroom is very versatile . Shiitake can be sautéed, broiled, baked, grilled, stir fried, or sliced thin and used raw on salads. Its meat flavor enhances almost any dish. Use the stems to create deeply flavored stocks.